Description: white, flat faced, bevelled edge tablet with characteristic odour, it is accepted slight marbling. Active ingredient: acetylcysteine 200 mg.
Inactive ingredients: ascorbic acid, sodium carbonate anhydrous, sodium hydrogen carbonate, citric acid anhydrous, sorbitol, sodium citrate, macrogol 6000, saccharine sodium, flavour �Lemon�. Active ingredient: acetylcysteine 600 mg.
Acetylcysteine is a mucolytic, expectorant drug, derivative of cysteine aminoacid. Due to the presence of a free sulfhydryl group, acetylcysteine breaks disulfide bonds of sputum acidic mucopolysaccharides, that leads to the depolymerization of mucoproteins and promotes the viscosity decrease of bronchial mucous. It relieves sputum discharge due to the increase of mucociliary clearance. Acetylcysteine also has antioxidant and pneumoprotective properties, this is due to the ability of sulfhydryl groups to bind free radicals. Besides, acetylcysteine stimulates the increase of glutathione synthesis, which is an important factor of detoxication. This property of acetylcysteine gives a potential to use it as antidote in acute intoxications by paracetamol and other substances (aldehydes, phenols, etc). After oral administration, acetylcysteine is rapidly and almost fully absorbed in digestive tract. The bioavailability of acetylcysteine after oral administration is about 10%. Maximal concentration after oral administration is achieved in 1 - 3 hours. In liver it is metabolized till cysteine (pharmacologically active metabolite) and diacetylcysteine, cystine and so on � till mixed disulphides. In body acetylcysteine and its metabolites are determined in various forms: partially - as free substance, partially � owing toblood plasma proteins, partially - as incorporated amino-acids. It is practically fully excreted as inactive metabolites (inorganic sulphates, diacetylcysteine) with urine. Only small amount of acetylcysteine is excreted unchanged with faeces. The half-life period from blood plasma is approximately 1 hour and depends on biotransformation rate liver. During hepatic impairment it can be increased up to 8 hours. Acetylcysteine can penetrates through placental barrier and be accumulated in amniotic fluid. - for relief of sputum discharge during acute and chronic sinusitis, otitis media. One tablet containing 600 mg of acetylcysteine is dissolved in 200 ml of drinking water at room temperature or one tablet containing 200 mg of acetylcysteine is dissolved in 100 ml of drinking water at room temperature. Drug should be administered after meal. Additional liquid administration increases mucolytic effect of acetylcysteine. It should be administered immediately after dissolution, in exceptional cases, prepared solution can be left for 2 hours. Grown-ups and adolescents upwards 14 years are prescribed 200 mg 2-3 times a day or 600 mg 1 time a day. Children aged 6 - 14 years are recommended 200 mg 2 times a day. Children aged 2 - 6 years are prescribed 200 mg 1 time a day. - patients with body weight more than 30 kg can be administered in dose up to 800 mg a day. Administration duration is 5-7 days during short-term catarrhal diseases. Drug should be admi-nistered longer time for achieving prophylactic effect from infections during chronic bronchitis and mucoviscidosis. - gastric and duodenal peptic ulcer in exacerbation phase. From CNS: rarely � headache, buzzing in ears. From digestive system: rarely � stomatitis; in some cases� nausea, vomiting, epigastric burning, diarhea. From cardiovascular system: in some cases � arterial blood pressure fall, tachycardia. From respiratory system: in rare cases � development of bronchial hemorrhage as appearance of hypersensitivity reaction. Allergic reactions: skin rash, itching, urticaria; in rare cases � bronchospasm (predominantly in patients with bronchial hyperactivity). Asibrox should be administered with caution during bloody expectoration, pulmonary hemorrhage, patients with esophageal varicose veins dilatation, adrenalopathy, hepatic and/or renal insufficiency. During bronchial asthma and obstructive bronchitis, acetylcysteine should be prescribed with caution under systematic control of bronchial conductivity. Acetylcysteine are prescribed to the infants only by vital signs and following strict control (ma-ximum 10 mg/kg of body weight). Asibrox contains sorbitol and saccharine sodium, that is why, doctor consultation is necessary before drug administration. It is necessary to use glass-ware during work with drug, to avoid the contact with metals, rubber, ox-ygen, slightly oxidable substances. Asibrox doesn�t influence the ability to drive a car and work performance, requiring a high speed of psychomotor reactions. Adequate and well-controlled studies about drug application during pregnancy and lactation period were not conducted. 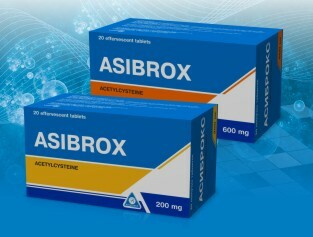 Asibrox is contraindicated during pregnancy and lactation period. Drug is contraindicated to the children aged up to 14 years (for tablets containing 600 mg of ace-tylcysteine). The mucus congestion can be occurred during concomitant use of acetylcysteine and antitussive drugs due to the inhibition of coughing reflex. Therefore, such combinations should be select with caution. It is reported synergism of acetylcysteine with bronchial spasmolytics. The concomitant administration of acetylcysteine and nitroglycerin can lead to the strengthening of vasorelaxant action of latter. It is pharmaceutically inconsistent with antibiotics (penicillins, cephalosporins, erythromycin, tetracyclines and amphotericin ?) and proteolytic enzymes. The sulfides with character odor are formed during contact with metals, rubber. It decreases the absorption of penicillins, cephalosporins, tetracycline (they should be applied not earlier than 2 hours after oral administration of acetylcysteine). Symptoms: it is possible diarrhea, vomiting, stomachache, burning and nausea. 24 effervescent tablets are in polypropylene tube, closed with polypropylene cap with silica gel. 1 tube is in a carton box together with leaflet. 2 effervescent tablets are in laminated strip. 5 or 10 laminated strips are in a carton box together with leaflet. 12 effervescent tablets are in polypropylene tube, closed with polypropylene cap with silica gel. Store in a protected from moisture and light place at temperature not exceeding 25�?. Close the tube tightly after the removal of a tablet. Do not apply after the expiry date.